Dashboards help users visualize the structured App data through a combination of widgets. Whenever you create a new App, Fusioo automatically creates a default Dashboard. You can either modify this Dashboard or create a new Dashboard from scratch. The drag and drop interface allows you to create your custom layout. Changes made to the Dashboard’s layout will be immediately made available to all users with access to that particular Dashboard. Note: You can control which Dashboards are accessible for every Role. You can modify Dashboards and add/remove any widgets by first clicking on the Dashboard settings icon and then click on either + Add Widget or Change Layout. Note: When you click on + Add Widget, and add a new widget, the Dashboard will automatically switch to the layout designer mode. You can change which Dashboard is displayed automatically when switching to an App. The first Dashboard in the list will be the default Dashboard for that App. To change the order, you need to move the Dashboard up or down using the arrows in the Dashboards dropdown menu. Note: Only Fusioo admins can change the Dashboard sequence. 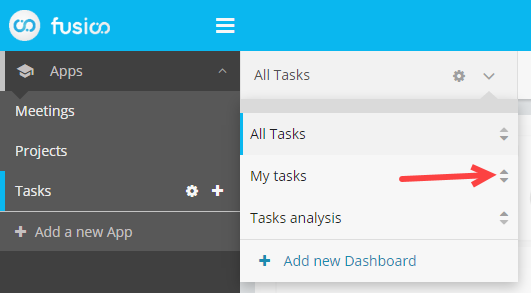 When you change the Dashboards order, they will be changed for all users of that App.